Paris, 1993. 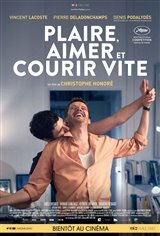 Jacques, a gay playwright in his thirties, shares custody of his young son with the boy’s mother. During a professional stay in Brittany, the writer begins a relationship with Arthur, an aspiring filmmaker. The death of a former lover to AIDS, then the slow deterioration of his own health caused by the same virus, will test the strength of Jacques' feelings for his Breton lover.